Downtown Makeover has found a set of plans for the new shopping center that is slated to be built on the Park Lane Mall land in Reno. His site doesn’t have any permalinks, so there’s no way to link directly to the post where he talks about the plans. Go to www.downtownmakeover.com and look for a post from today, 3/21/09 – NEW PARK LANE PROMENADE PLANS. I’ve made a copy of the plans themselves here so you can see them. There’s nothing hugely exciting about these plans. Just an ordinary outdoor mall, with a parking lot in the center and stores ringed around the outside edge. Very similar to the Sierra Summit, as a commenter pointed out. 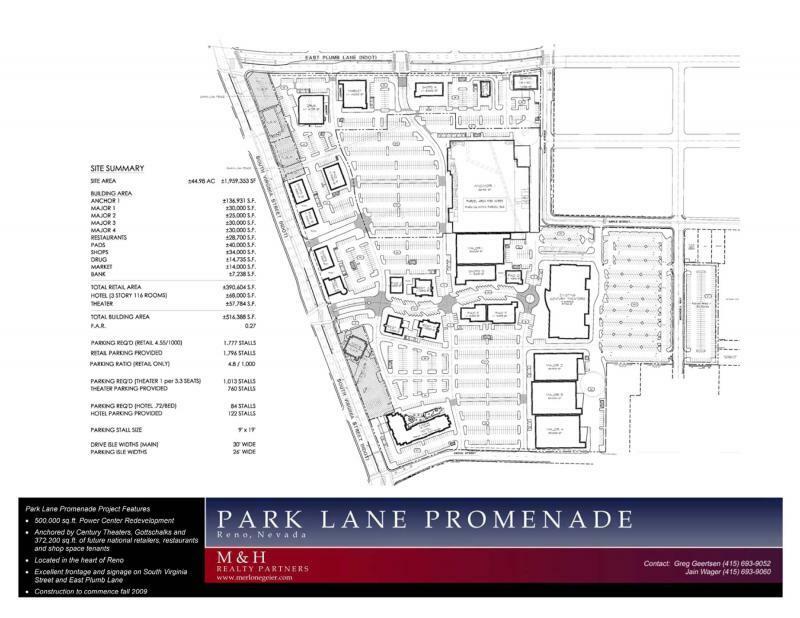 The only signature feature is the namesake “promenade” between Virginia Street and the Century movie theater, but even that is designed for cars and parking, not for people to get out and stroll on foot. Indoor malls make so much sense here in Northern Nevada, where 10 months out of the year it’s either too hot or too cold to be outside. So I don’t know why the indoor malls are going away and outdoor malls are taking over. Next Keep tax records for 7 years then what? we saw last night that the old building that housed Sears and Gottschalks (?) is gone now. only the theater, demolition equipment, and rubble occupies what is now one of the biggest parking lots in washoe county. and totally agree with you on indoor malls. Just before they closed the main mall portion went to an evening movie with my little daughter then we walked into the mall where we had a wonderful wander including the great candy shop still there. Had so much fun: such a pretty place with mirrors, multitude of colors, terrific lighting, halls going off to the sides with stairs to the basement level…many stores closed down by then but many still open. Seemed in wonderful shape and very clean & vibrant: one of the most asinine, stupid, ill-timed, ill-advised actions ever to destroy it and for what? An awful shame. All this will do is make us drive around MORE and waste MORE gas plus everybody will be out in the cold during winter months instead of a climate controlled center that has round the clock security. Malls are only a place of crime if they have poor security and poorly trained workers. Where are people’s spirits? Why does everything have to be all the same today in terms of architecture instead of using *culture* for patterns? When will we ever go back to having a choice instead of everything made in China? When will I stop thinking so much and act like the model slave everybody expects out of me? Kyle, you make a great point. Park Lane Mall was a BIG part of my life growing up in Northern Nevada. Living in Carson City in the 1980s and 1990s, we had no choice but to go to Reno when we wanted to shop or have any real kind of fun. I was ok with that because I love Reno (still do). 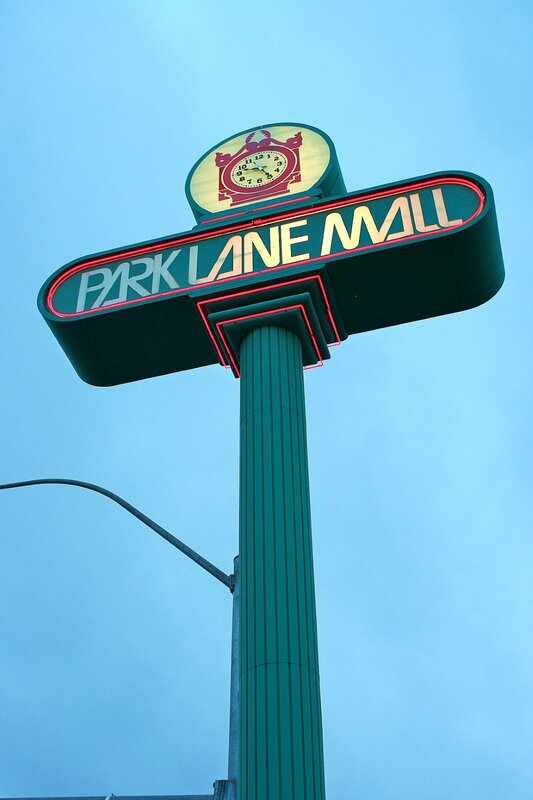 Of the 3 malls that existed in Reno during that time, Park Lane was my favorite. I never really (and still haven’t seen any evidence to change my mind) considered Old Town (now Reno Town) Mall to be a mall. It just never had the “mall” feeling that Meadowood and Park Lane had. But even Meadowood just didn’t have the feel that Park Lane did. Park Lane gave me some of the fondest memories I have of childhood. Even well into my adult years I would make trips to Reno just to hang out at Park Lane. The neon hallway and the big golden rings sculpture were two of the most interesting things I loved about Park Lane (that and Woolworth’s). I moved away from Northern Nevada 13 years ago. Since that time I have watched (in return visits) the progression of a deteriorating mall, to a closed mall, to a pile of rubble, and now to an empty fenced off lot that serves as a grim reminder that Park Lane will only be a distant memory for me from now on. We have a town center here in Des Moines that is very much like this promenade they are proposing for the Park Lane space. As you mentioned, you can’t even get from your car to the store without some blockhead trying to run you over because they are talking on their damn smartphone while their peeling through the parking lot at 105 mph. Personally, I think what they should do is build a NEW Park Lane Mall that could rival with the Mall of America in Bloomington, MN. I think as a society we have allowed capitalism to get out of control. Having the freedom to make a personal profit is a great freedom that also comes with a great responsibility. Yet at the same time, it seems like our cultural value is to be all about and for the freedom, but to neglect and be against the responsibility that comes along with that freedom. Anyway, like I said, you stated a great point. Somebody had to say it…if not you, then who? What you are being taught in school is a lie set up a long time ago by your’s truly to get you to vote for their way which is to allow everything to be controlled centrally. They want you to believe being a capitalist is evil so you will vote for paying jobs with benefits to leave the country and be replaced with crappy service jobs that have no benefits. Hope you enjoy flipping those Mcdonald’s burgers you’re whole life! If you read old books you will find it was pretty common for large families just to have the Dad working and they survived just fine if they watched their budget carefully. Most of the people who had troubles were immigrants who didn’t understand our culture or values of loving you’re job so they struggled and while there was racists a lot of that was over-reactions due to a lack of communication. So somebody from somewhere got pissed at another somebody somewhere and that somebody somewhere went to tell another somebody somewhere whom started race rebellions to other somebody’s from somewhere instead of working things out. Now we have severe culture misunderstanding and the *Multiculturism* only makes things more offensive making it even harder to express. Now you have the *hurt feelings police* patrolling the streets. Growing in Carson City, I always thought it was great how Northern Nevada could change with the times while preserving its rich historic values and landmarks. Now everytime I come back to visit, it feels like the general attitude is “to hell with history, let’s try to beat everybody into the future.” I understand the need to keep up with the times, but I also believe that preserving the history of the state is just as important. I also believe that the history shouldn’t just be on display in some museum. Living history is far more interesting, and I’ve always thought of Nevada as one of the best places to see living history. The closing and demolition of Park Lane Mall might be a far cry from destroying a piece of state history, but to me it’s more about what that idea represents. I’ve seen a lot of changes happen in the Reno/Sparks/Carson City area (on my visits back to Nevada) that I don’t really agree with. Unfortunately I’m not the one in the position to make the decisions regarding the status of progress. It’s not just about state history though. I feel like many of these events carried out “in the name of progress” also destroy our personal histories. I’m sure I’m not the only one out there who had sentiment regarding Park Lane Mall…or any other place in Reno that has changed SIGNIFICANTLY over the years. I’m equally disappointed with the changes that were made to Circus Circus following the opening of the Silver Legacy…you almost can’t tell the difference between the two now! It’s hard to see just where one casino stops and the other begins! I’m sure that is how it was intended. I really miss the days when Circus Circus was FULLY circus themed. The Big Top Buffet (which is now the Courtyard Buffet), the 3 Ring Coffee shop (where I spent many a night after graduating high school…now called the Americana Cafe), and just in general, the circus theme of colorful carpeting, and an atmosphere conducive to a child which even made adults feel like a kid again. Well, I think I’ll end my tirade there. I’m starting to get homesick for a time and place that no longer exist (and even for the place which still exists, but in a different time and in a different way). Even with all of the changes that progress continues to bring about in Northern Nevada, and all of my memories and state history that progress seek to destroy, I still think Nevada is the best state in the union and that Reno/Sparks/Carson City is the BEST place in the whole universe! I agree that indoor malls make more sense here in N. Nevada, however you don’t have to heat or cool open space like you would an indoor mall. Since this site is still dirt and weeds I guess it doesn’t matter much anyway! You still have to heat and cool the large big box stores which winds up being about the same. One thing we learned is most chain stores do not have controls to the heaters and AC. Safeway has a central heating unit in LA that controls all the stores. We’ve often wondered why Safeway and other stores are always too hot or too cold for the temperatures and learned that the manager can’t control it. When it’s hot in the spring in LA all the Safeway’s have the AC on so in northern climates Safeway will be cold inside! Actually Chris as a country we are no longer capitalists. We are monopolists where you have a bunch of companies controlling each other like how Disney is owned by ABC which is owned by some rich insurance company I think. True capitalism doesn’t let that happen but we haven’t had true capitalism since the 50s/60s. 70s and 80s had some capitalism left but declining with quality products heading down the crapper as we buy things from slave labors in China who work 12 hours a day from Sunday-Sunday. Our generation has never seen *quality* products.